A chapter of my life ended last Friday. It’s been an odd feeling, saying goodbye when I am so ready to move on. It’s no secret that Minneapolis and I have had an extremely complicated relationship. There are things that I truly adore about the city (i.e. the best bike commute in the world) and the people I’ve grown to be friends with and yet, this is a place that will never be close to my heart. No doubt a valuable period in my life, but one where the bright spots shine poke through the cover of bleakness. Over the weekend while most of my earthly belongings headed towards Georgia, I sprinted into to the open arms of the Pacific Northwest and my family for a short intermission before I begin life in Atlanta. I packed the car with my most valuable treasures (the two cats, my new and fabulous bicycle and the contents of my spice cupboard) and drove 1700 hundred miles in my 10-year old car with my 23-year old cousin to Olympia. Somewhere in the middle of North Dakota an epiphany struck. This road trip, and more importantly, my postdoc in Minneapolis was a constant tug-of-war between ‘making good time’ and ‘having a good time’. I chose my postdoc for the science and for the mentor, despite the fact that it meant that I would have to live in the Midwest (in contrast to most of the other postdocs in the lab who wanted those things AND had strong familial ties in the region). So from the outset, my postdoc was simply a strategic hoop to jump through to land a coveted faculty position, wherever that may be. I didn’t set out to ‘have a good time’ but rather to ‘make good time.’ So I shied away from making friends and making Minneapolis home, as that would take time away from my scientific and academic goals. I’m not one who believes that scientists live in isolation and are wasting time when not working. I took time off, travelled and spent many a weekend with my dearest friends that I’ve accumulated over the course of my life to either celebrate major life events or to simply hang out on the couch with a glass of wine. These were the people that I had already invested in, value beyond all else and whom I wanted to spend my time with whenever possible. So I flitted off to Chicago, Austin, California, Durham, Olympia, Paris, Portland, Boston, etc. to keep those people in my life. All at the expense of making ties in Minneapolis. The same is true for my academic community. The University of Minnesota was simply a stop along the way. As a postdoc, it’s difficult not to feel like a ghost. You sneak in during the middle of the night (your start date is almost never tied to the academic calendar) and you pass people in the halls without acknowledgement. I just did not have the capacity to invest in the department. Resolving that conflict was hard – I was deeply committed to my intellectual community as a graduate student and I am looking forward to making my mark in the future. But in this time and place, during my postdoc, I couldn’t do it and felt guilty for not trying harder. So I ‘made good time.’ My one and only postdoc was four and a half years long – a blink of an eye in the current academic market. In a time when a lot of people are leaving academia, doing 6-7 year postdocs or multiple postdocs, I have been extremely successful and even so, I felt like this took too long and there have been costs inextricably tied with my success. My life could have taken a different turn a couple of years ago and I would have left Minneapolis at that time. I have fretted incessantly (and unnecessarily) that things will fall through at the last minute while preparing for this move. This person who I am, who I’ve become is due entirely because of my past experiences, which I consider to be a result of the context and my decisions at any given time. And that particular turn let me take the opportunity to invest, just a smidgen, in Minneapolis. As such, this goodbye is more complicated than I anticipated. Yet I revel in it: my life has been rich, varied and complex and I wouldn’t have it any other way. Goodbye Minneapolis. You haven’t been my favorite, but you have been important. There’s no metaphor tied to this salad. No anxious, overwrought voice in my head that asks ‘How can I completely overthink this dish to best represent my emotions?’ Don’t worry – I’ve barely scratched the surface of my food-as-therapy inclinations. But here and now, this is just a salad. In summers past, I’ve played the ‘how do I use all my vegetables before the next box arrives’ game. 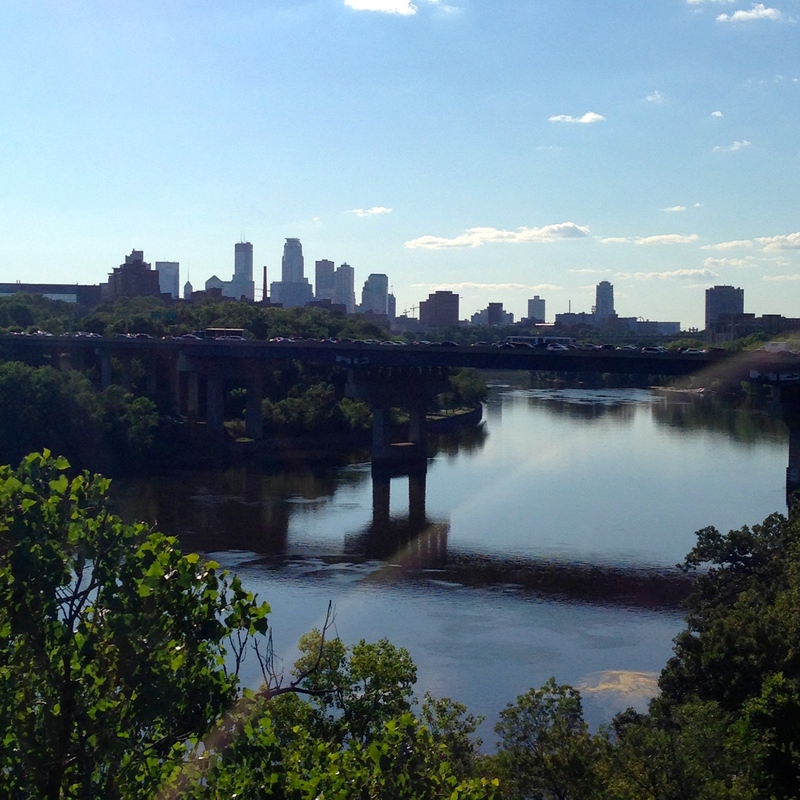 Not so this summer – I’m leaving Minneapolis in just FIVE DAYS (!!!) and now is right when the season is hitting its stride. So, to replace the CSA game, I’ve developed a new one over the past several weeks: Clean out the pantry before I move! I never meant to have farro in my kitchen. I accidentally bought it during one shopping trip when I meant to get freekah (for the most amazing pilaf), but as always happens when I shop on my way home from work, I forgot my grocery list and relied on my memory. Turns out, my memory isn’t always the most reliable source of information. 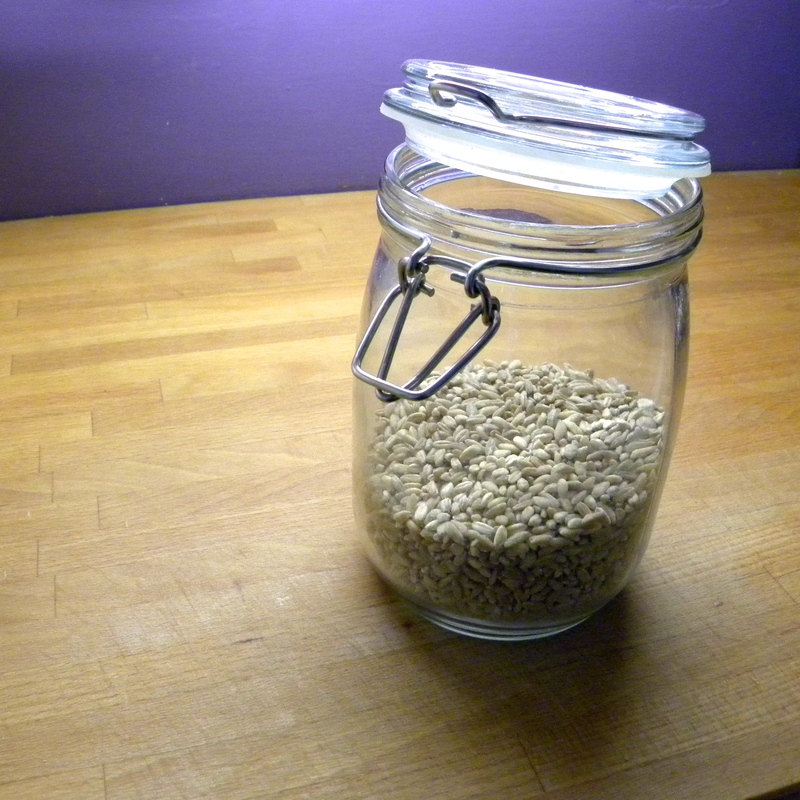 My pantry has been harboring farro as a fugitive ever since. I love a good salad (even if most of you must think I only eat ice cream) only they frequently leave me craving a cookie by mid-afternoon. Particularly at this time of year when I am cycling 6.5 miles to get to campus. But this salad – oh this salad! Who knew something made up on a whim some random summer evening while Skyping with the family would leave me so smitten. It delightfully manages to keep my hunger at bay. Not only that, but it maintains its integrity over several days as the farro just keeps soaking up the juices from the cucumber, tomato and corn. A win by all accounts. In a medium pot bring farro and vegetable stock to a boil. Reduce heat to a simmer, cover and cook for about 20 minutes, until tender. Drain remaining cooking liquid. While farro is cooking, whisk together extra virgin olive oil, lemon juice, salt, sugar and pepper. 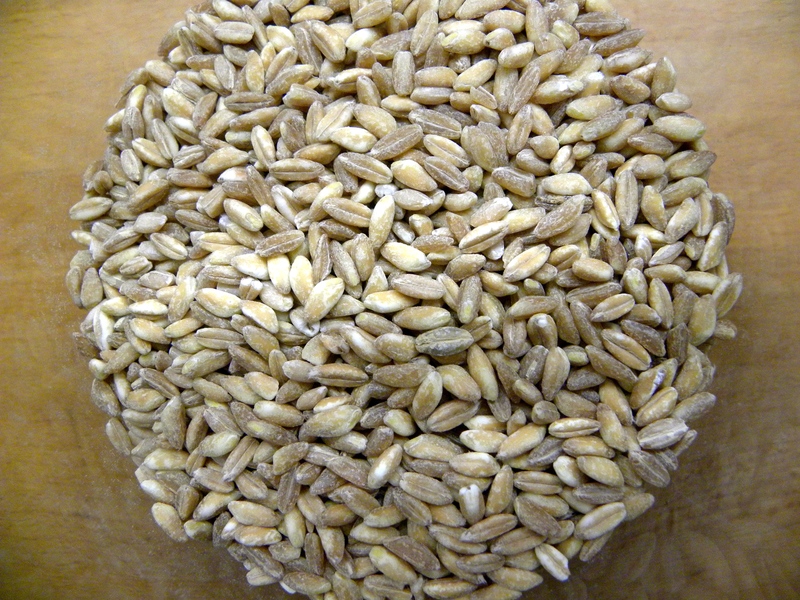 Toss with warm farro. In a saucepan, heat olive oil and cook shallots until softened, ~5 minutes. Add corn kernels and coriander and cook 5 minutes more. 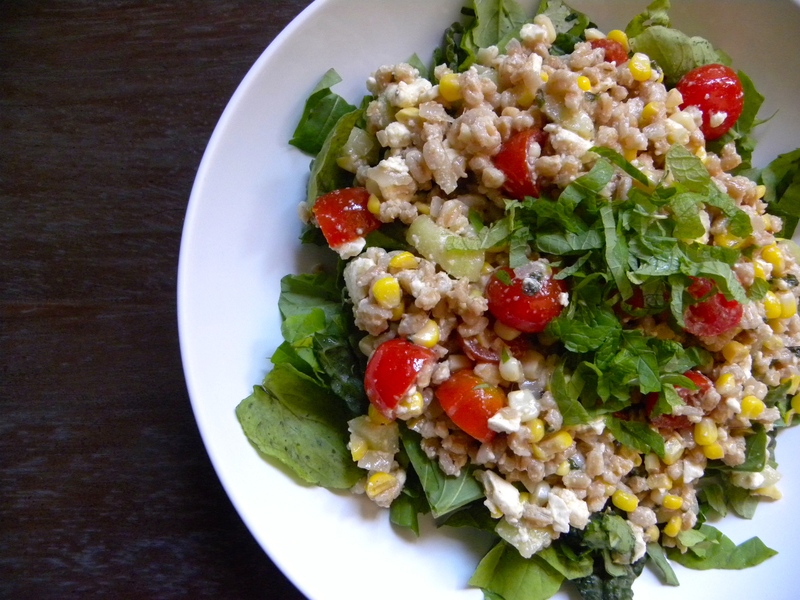 Toss with the farro and add tomatoes, cucumber and feta cheese. Serve atop a bed of arugula and garnish with mint. I care deeply how others think of me. I enjoy being distinctive (my purple hair certainly plays a large part in achieving this – and I love that). I am to be taken seriously – but not always seriously. I like that people like to be around me and that my thoughts and opinions are valued. That I am trustworthy and my research is well-regarded. And that my awesome style impresses upon others. Am I shallow? Narcissistic? Too female for science? I have cried at work, on more than one occasion and even (gasp!) in front of other people. I’m incredibly open about my mood and my feelings (that seeming span a wide-spectrum). There is a hefty dose of reverse snobbery in academics – that our minds are the only thing to be valued. That we are completely objective towards all things. To say nothing of the passive-aggressive attitudes towards those with pastimes outside of science. I, like so many others, am a complex being with a wide-array of interests and emotions. I refuse to apologize or feel shamed about that. In fact, I think it allows me to step back to see the larger biological questions and think more creatively. I have a hard time discussing gender and science and am extremely sensitive to broad sweeping statements on the subject. Both my Ph.D. and postdoc advisors are female, from different generations and are unalike in many ways. They are two distinct people after all, and who is to say that the commonalities they do share is because of their gender? The same is true of my female peers. I’m not in any position to speak for them. But I think about it. What does it means to be a female in science? More importantly, to be me? I am decidedly female in my wardrobe – I own about 15 dresses to every pair of pants. You won’t find me in any neutral colors either. I wear heels. I occasionally put make-up on. I spend a considerable amount of money to control my curly hair. I have never been interested in wearing contacts because I think my glasses make me look smarter. I contemplate at length the appearance I present to the world. I agonized over choosing a photo for my faculty profile – they say a picture is worth a thousand words. I wanted something that illustrated my intellect, my openess, and my style all the while staying inside the lines of professionalism. Is that even achievable? It’s more than just the way I dress: I try to smile often to seem friendly and approachable – but not too often because I don’t want appear a pushover. I frequently nod during seminars or in conversations to indicate that I am paying attention but don’t hesitate to hide quizzical expressions. At conferences I make a point of asking intelligent questions during the public forums and staying out late to drink beer at the bar with my fellow nerds. I am actively trying to stop apologizing or making excuses for delayed responses. I do these things deliberately because I am female, but mostly because I want to be a vibrant, noteworthy member of my community. I am making my way through the leaky pipeline and now find myself in a tenure-track position. The department I am joining has exactly two other female professors. Whether I like it or not, I will be an example. Hopefully in time, even a role model for scientists-in-training. My voice has weight. I worry about what sort of mentor and colleague I will be. Not only do I want to be well liked and respected, but to also inspire those I work with and lead. I try my hardest to have my interactions with others to be open, honest and thoughtful, which at times, can be mutually exclusive with being nice, but never with considerate. My intentions are always to be critical of the science, but not of the scientist. I just hope that I can achieve that without those exclusively female labels. When given a choice of berry – I always pick raspberry. Their bright sassiness endears them to me. 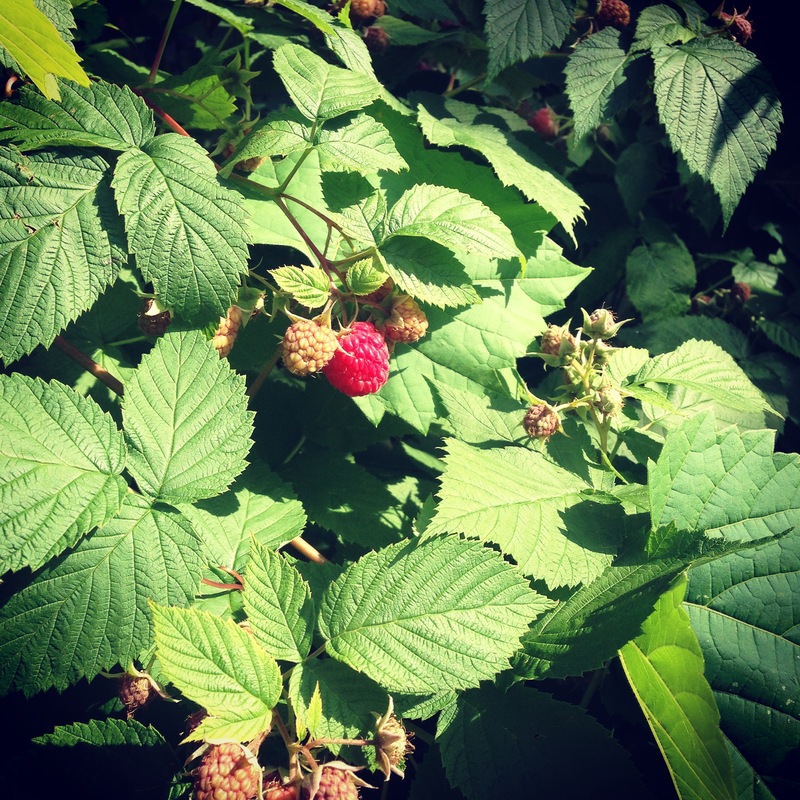 I chanced upon enough of these beauties in my backyard to make a jam (coupled with some strawberries a day or two past their prime) last weekend. 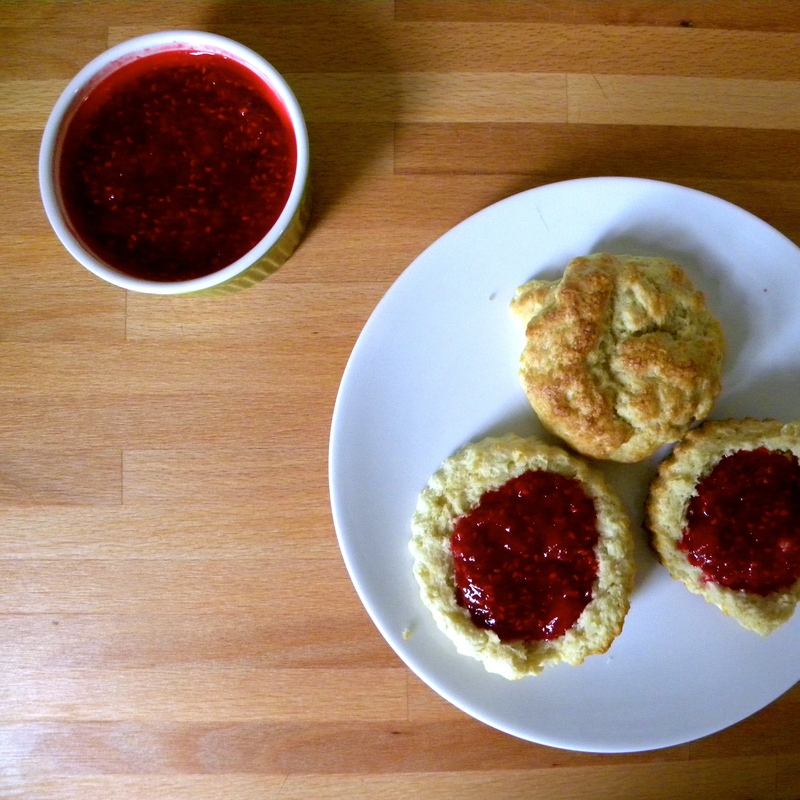 This jam is unapologetically tart. It doesn’t sugarcoat the ‘I AM RASPBERRY’ spirit. 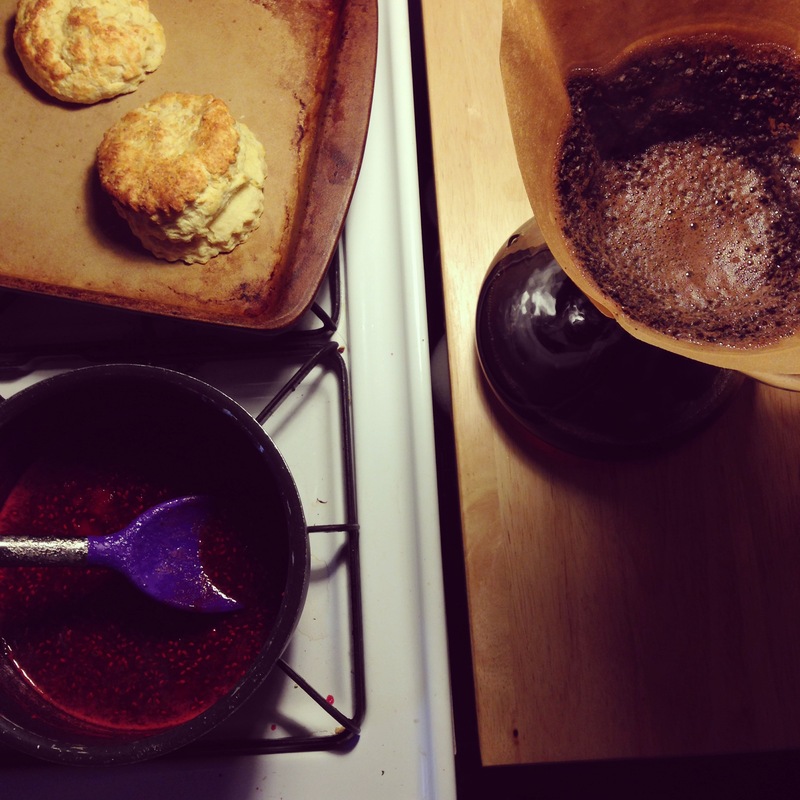 Enjoyed best with a batch of buttermilk biscuits and a steaming cup of coffee on early on a Saturday morning. Collect the ingredients in a small saucepan and Cook over medium-high heat for 10-15 minutes. Mash slightly. The jam will thicken slightly as it cools. Cover and refrigerate any leftovers – it will keep for a few days. Every year, I eagerly anticipate the arrival of rhubarb. I simply cannot wait for it to appear at the market so that I can swoop in and take a few pounds of crimson stalks home with me. I obsess over it, as my friends and family can attest. Then an odd thing happens: I freak out over what to make with my bounty. The potential paralyzes me. It has to be something that lives up to the utter brilliance of the tart and tangy and gloriously pink rhubarb. The anticipation nearly kills me every year only to have the reality stop me cold in my tracks. I don’t always succeed in making a showstopper. Sometimes things are just okay, like the rhubarb shortbread bars I tried to make recently. They looked horrendous, all grey and sludge-like, but mostly just tasted like butter and sugar without a single note of rhubarb. Edible, but unimpressive. Other times I downright fail. Caramelized rhubarb-upside down cake with cornmeal and buttermilk? Not from this kitchen. I can’t even begin to tell you all the ways that didn’t work out. Somehow, these attempts are even more devastating in light of all the great things that I have done with this vegetable-disguised as a fruit. I can do better than this. They also, without doubt, feed into the vicious cycle in my head of placing rhubarb on a pedestal and expecting it never to tumble. I’m an over-thinker and this particular trait constantly gets in my own way. It’s no different with starting my own laboratory and becoming a professor. This goal has been hanging over my head for the entirety of my adult life and now that it’s in my grasp, I worry that I won’t live up to the promise and to my own abilities. Sidenote: The line ‘I know he can get the job – but can he DO the job?’ from Joe Vs. the Volcano has been playing on a loop in my head. After watching this movie when I was a kid, my dad and I used to quote this constantly. I’m supposed to be buying equipment and hiring people. The university gave me a staggering amount of money in a generous show of support of my research potential. I can imagine that for some, this must feel like being a kid in a candy shop, but, for some reason, I am hesitant to jump right in. The fear of failure is overwhelming. How does one get past a crisis of confidence? It’s not as if I haven’t been working in a yeast lab for the past decade, accumulating and storing experience and knowledge for just this thing. Is it because I am female? Or simply an over-achiever and perfectionist? Perhaps it has to do with my current context in Minneapolis (I’m one of the last in a lab that has relocated halfway across the world, a situation that makes me simultaneously feel completely independent and utterly abandoned.) It’s likely a little of all these things. And to complicate matters further, the feelings of fear are are intimately paired with an unbridled excitement for the future. In the end, I think my strategy will be go with what I know, but push it to the edge. It’s a perspective that suits me well in my research, in my style and in my food. 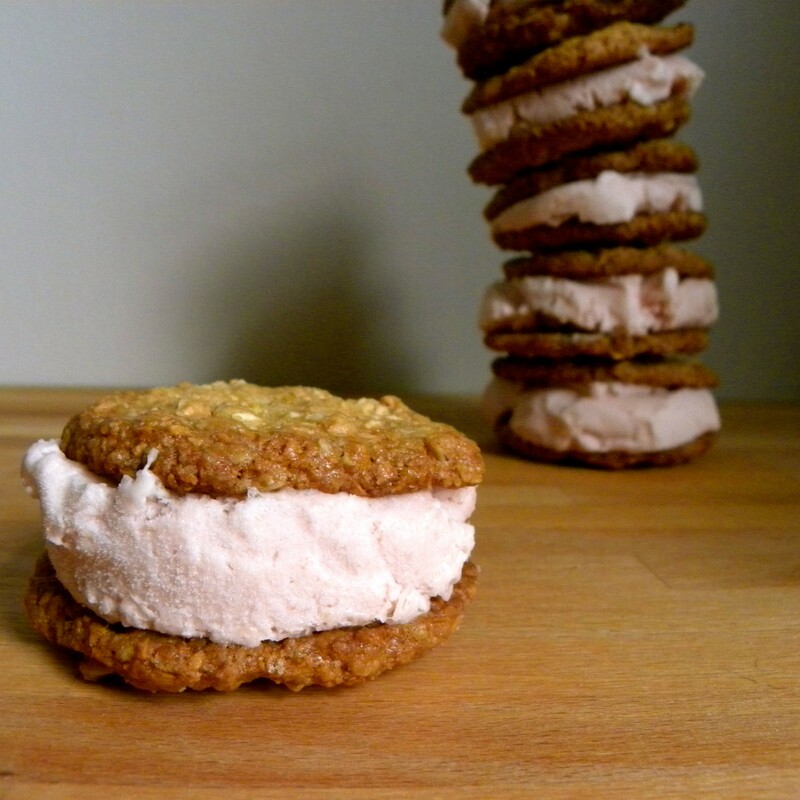 Rhubarb rosewater ice cream sandwiched between two thin and crispy oatmeal-coconut cookies. Edgy, yet entirely approachable. It’s a riff on my take for Grabbers and worth a re-visit. 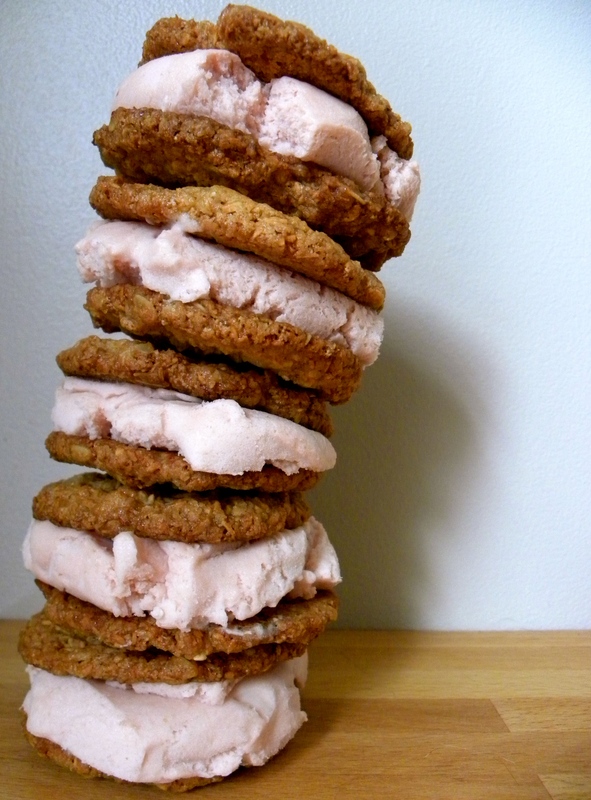 In the years since I published the first, I know a fair amount more about ice cream and even something about the cookie characteristics best suited to sandwiching. Not to mention a look back on my musing regarding the many (many!) colleges and universities is timely as I prepare for my move to Emory. The originals are good, but I think these are better. In a small saucepan, cook rhubarb, honey and lime juice over medium-low heat until rhubarb completely breaks down, about 10-15 minutes. Stir in rosewater. Set aside. Mix 2 tablespoons of the milk with the cornstarch, until dissolved. Set aside. Whisk cream cheese and salt in a medium bowl until smooth. Set aside. In a medium pot, combine remaining milk, cream, sugar and honey. Bring to a boil over medium-high heat and cook for 4 minutes. Remove from heat and pour through mesh sieve. Return to pot and whisk in cornstarch slurry, cooking until slightly thickened, about a minute. Remove from heat. Gradually pour the hot milk mixture into the bowl with the cream cheese, whisking constantly until smooth. Pour through mesh sieve to remove any clumps. Stir in rhubarb. Chill mixture thoroughly. Churn ice cream base in ice cream maker. Freeze at least 4 hours. Whisk flour, baking powder, baking soda and salt together in a medium bowl. Set aside. Mix together butter and both sugars at medium-low speed until just combined. Increase speed to medium and continue to beat until light and fluffy, scraping down bowl as needed. Add egg and vanilla and beat on medium low until fully incorporated. Reduce speed to low and add flour mixture until just incorporated and smooth. Gradually add oats and coconut and mix until well incorporated. Give dough a final stir to remove any flour pockets and evenly distribute all ingredients. Working with 2 tablespoons of dough at a time, roll into balls and place on baking sheet. Using fingertips, gently press each dough ball to ¾ – ½ inch thickness. Bake one sheet at a time until cookies are deep golden brown, edges are crisp and centers yield to slight pressure when pressed, around 13 minutes. Transfer to wire rack and let cookies cool completely. To assemble sandwiches: Take ice cream out of the freezer about half an hour before assembly and let it soften slightly. 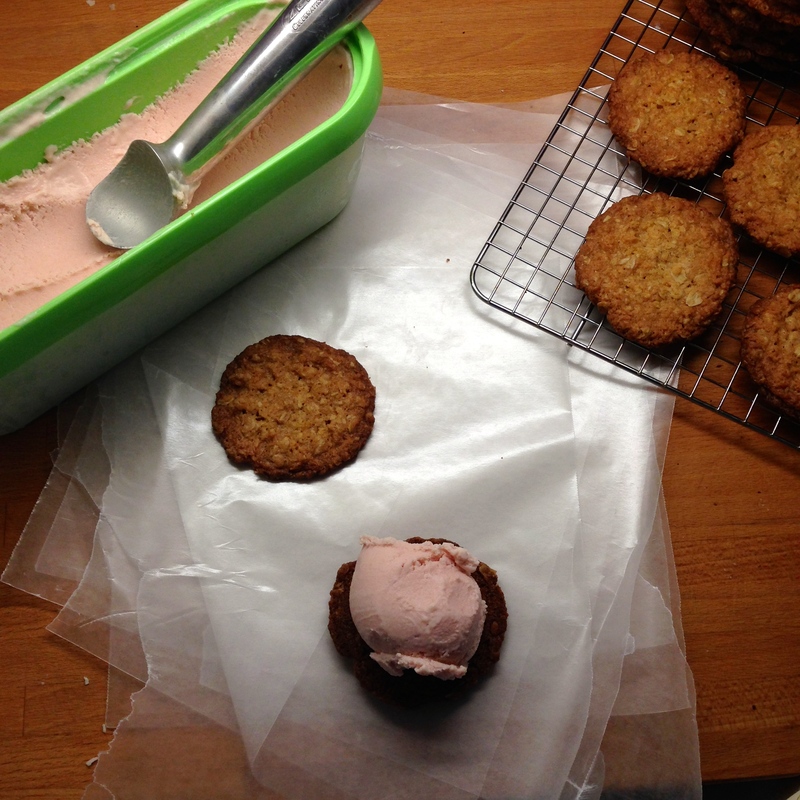 Place a generously sized scoop onto the backside of a cookie and top with a second. Wrap in wax paper and store in the freezer. Enjoy at will.